One of my favorite places to look for makeup in Japan was your regular ol’ Japanese drugstore. Before leaving, I made a list of things to check out at the drugstore. After a few trips here and there, I’ve found some of my favorite ones (so far). Oh, Dramatic Memory Rouge, how I wanted to hoard you. I saw these first at Kate’s swatch post, and they were on the top of my list to try. 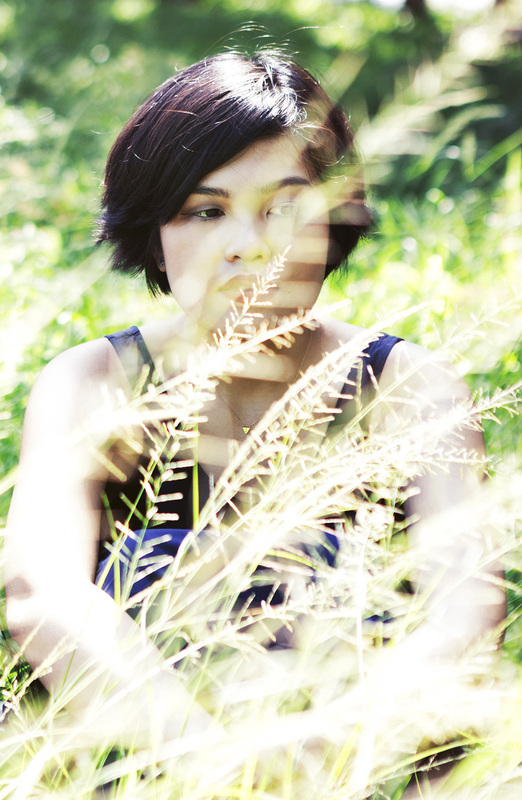 Of course, I gravitated towards the deepest, rosiest shade there was. 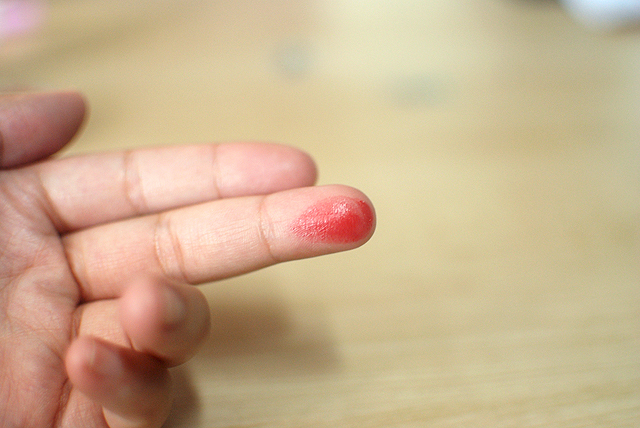 This is in RS-1, which is a rosy-plummy berry that is absolutely beautiful. The formula of the Dramatic Memory Rouge is moist and kind of sheer, which I noticed is a quality that most Japanese drugstore lipsticks have. They also often have a little bit of glitter and sparkle but they’re never there to add bling to your lips, just a bit of sheen and shine. It’s weird, but it’s true! 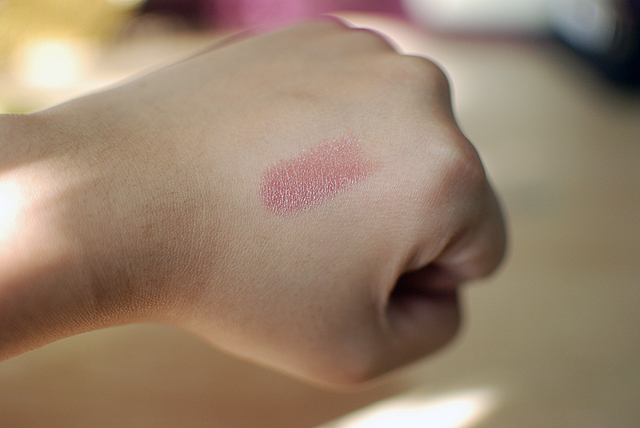 I really wanted to swatch this right away, so forgive my just-woke-up face. 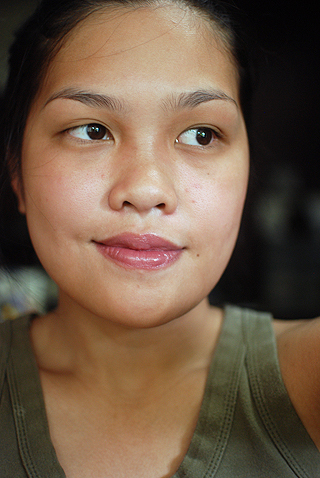 As you can see, the application of this is kind of sheer but still decently pigmented and has a moisty sort of shiny. Believe me, I really wanted to get more of these (I had RD-3 and PK-1, I think, in mind) but Sarie would say things like “Doesn’t that look like [Chanel Rouge Coco Shine] Boy?” or “Doesn’t that look like [some other shade here]” and when someone who does not care about makeup goes hey, I’ve seen that before and actually get it right, you know you don’t want to cross the line over to Hoarder Territory. These are ¥1575, which is about $16 or so dollars. I was on the fence about this blush for a long time before I finally decided to get it. The lighter shades I was looking at deposited quite a substantial amount of glitter—something I’m not too fond of for cheek products, unless it’s a luminizer or something similar. 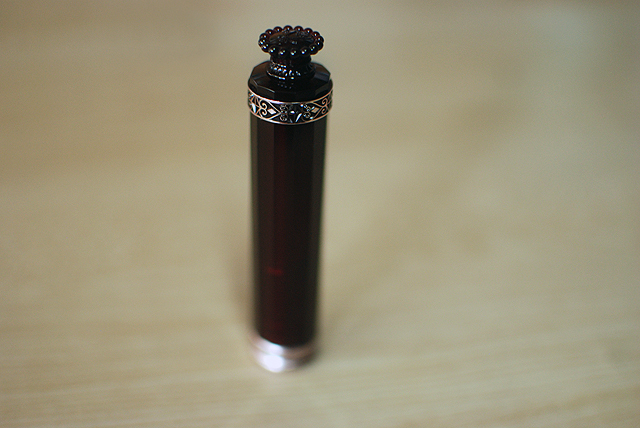 My eyes finally landed on CL01, which looks like a pretty shimmer-free red. 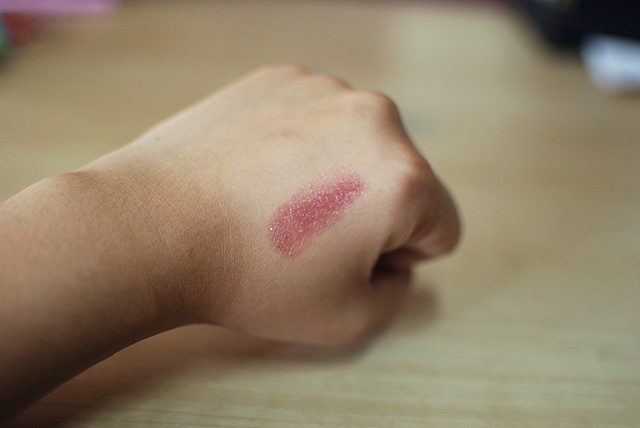 As a swatch, it looks kind of scary, but on the cheek and blended out, it’s quite a beautiful, natural-looking blush. I ended up liking it so much, I got another pot. I wish I got more colors, too, as this is a great product, especially for the price, which was between ¥600 and ¥800—I can’t remember—or $6 and $8. Sadly, since the other shades seemed to have a bit of glitter in them, I didn’t even consider them. Looking at reviews online, though, the amount of glitter—almost negligible on the cheeks—shouldn’t be a deterrent. JK, I found a picture. 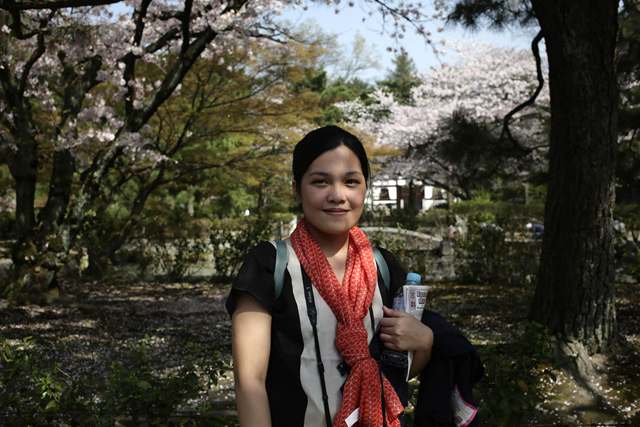 This was in Kyoto, and was taken by Sarie! 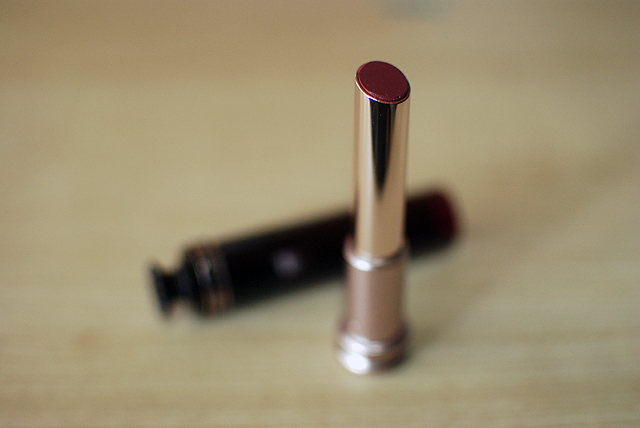 The Kate Rouge HD Lipstick is fairly moisturizing with a bit of shimmer and sparkle. Truth be told, it’s kind of hard to find a drugstore lippie in Japan that has zero shimmer, but I really think these are used to make the lips extra shiny. There has been no issues of unwanted frostiness or glitterbombed lips, so that’s OK in my book. PK-17 is a medium rosy pink. It’s the only one from the line that I’ve tried to swatch, and I specifically sought it out because of this post by Glossed in Translation. Predictably, I bought the wrong formula, but I still do love this purchase. It goes on sheer and is fairly moisturizing. I wore it around a few times in Japan, which is a drier, colder climate than I’m used to. The formula is somewhat creamy and balmy. It goes on the lips well and does not sink into fine lines or cling to dry flakes. As you can see, the glitter doesn’t really make much of an appearance, other than to catch the light and make your lips plumper. 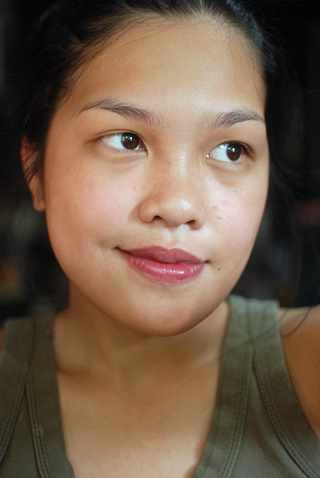 The color of the base is a very natural MLBB pink and for something wrong that I picked up, I’m quite happy with it. 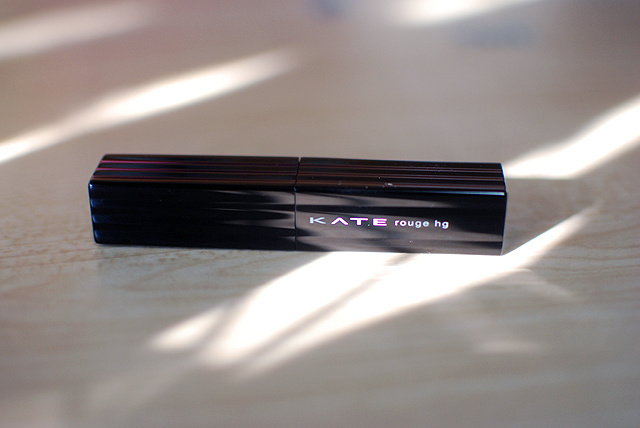 The Kate Rouge HD comes in a pretty metal-like case that looks sleek and expensive. It is my favorite drugstore case, by far. These retail for ¥1,400 or about $14 each and is well worth the money. Though part of me is happy and proud that I did not hoard, I wish I got more colors because I really enjoy the whole look and formula of these lipsticks. 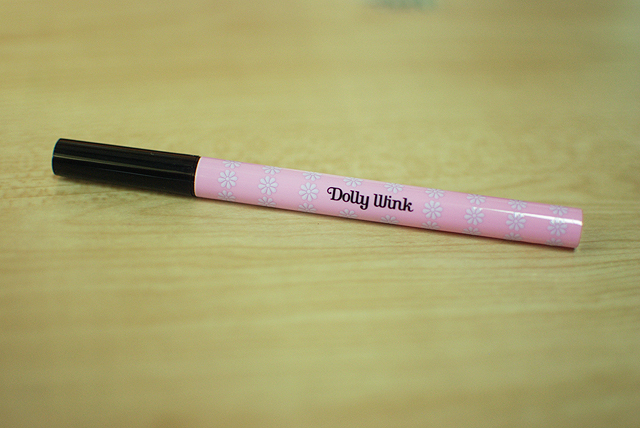 This is my first Dolly Wink product and I like it enough. 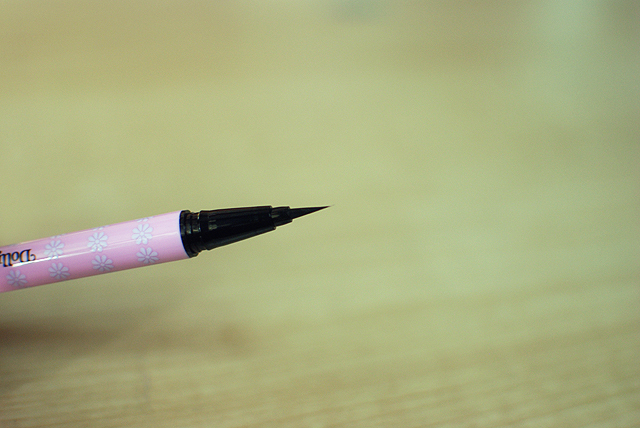 The tip is very fine and the liner is not too watery. The “problem” lies in the lines. The good thing about the tip is that it responds to pressure. A light hand will produce a thin line; a heavy hand will produce a thick line. But, as you can see, the heavier hand deposits too much pigment which leads to a messy line. The product bleeds into fine lines and feathers. It is fairly easy to build up, but it obviously takes more effort and practice. 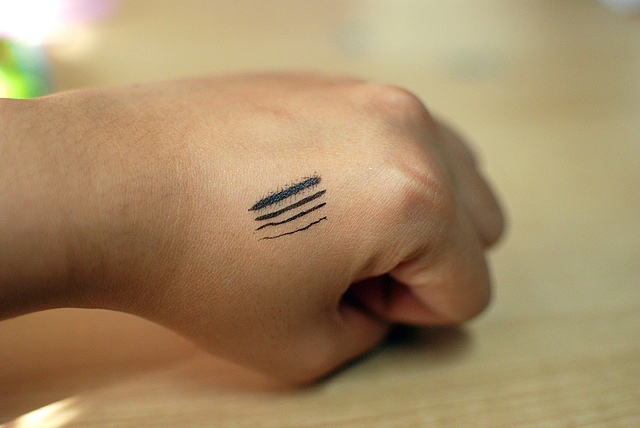 Just for ease of use, and I suppose accessibility, I prefer my regular K-Palette liner. Though, of course, this is a good alternative. Dolly Wink’s SRP is ¥1,200, which is around $12. That’s it for now! 🙂 I hope you all enjoyed this post. I hauled quite a few more items, including some for my mom and sister, so I’ll try to post reviews of those soon, too. Japan was a beautiful country; that they make awesome cosmetics is just a plus! Why is packaging so CUTE over there..! argghhhh – I would go nuts in a Japanese drugstore. I ‘d walk out with everything. Now, I may have to scavenge ebay for that lippy at an inflated price. YAY! I bought a pair of falsies (just one, hehe) so I’m excited to try them out. 😀 Do you live in Manila? Where do you buy Dolly Wink products? I know! It was like, how do you even know thaaaat. Hahaha. I actually wish I bought more eyeshadow! Haha but there is no room for regret~ LOL. I had someone (a friend of my sister’s) get a few more items for me from Addiction because they’re releasing a collection in May that I MUST HAVE. So I hope she manages to get some. I prefer the K-Palette liner, if that helps. 🙂 Where do you get your Dolly Wink lashes here? 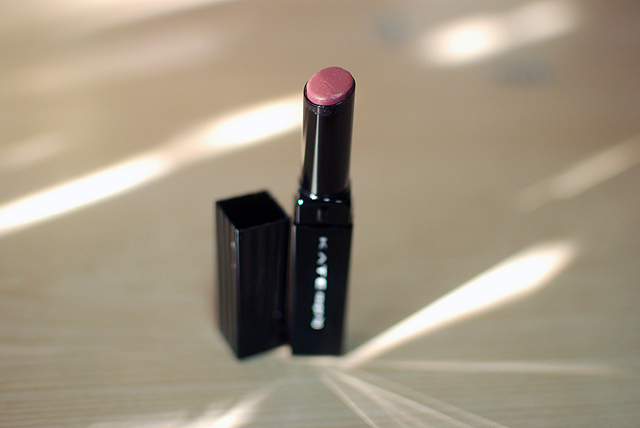 This Lavshuca Dramatic Memory Rouge Lipstick in RS-1 looks naturally good on you!! If i’ll be given an opportunity to go to Japan this is one of the first things I’ll be looking for! And the packaging… Oh my goodness (though I actually thought it was majolica Majorca :P). The canmake cream cheek indeed got some shimmer but as i have observed, the color lasts pretty long on my cheeks plus its saves me from using a highlighter on top of my cheek bones. Aw, thank you Ranne. 🙂 I hope Kanebo can bring it in one of these days. They sell some of their products here, particularly Kate, so I hope they bring in Lavshuca. 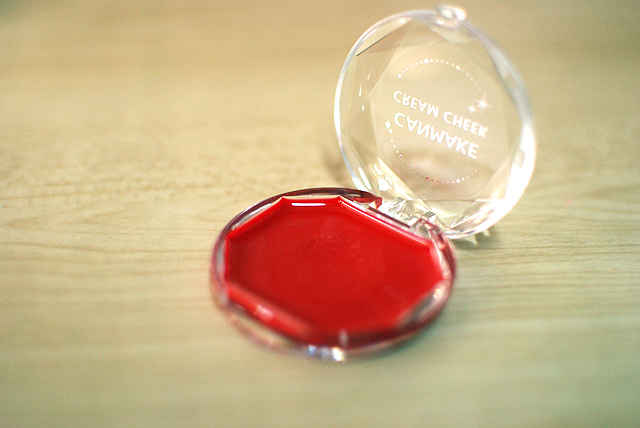 I think the Canmake Cream Cheeks have some shades without shimmer, such as this one that I got. 🙂 But I agree, the color is so long-lasting!